Your Dream House just came on the market! 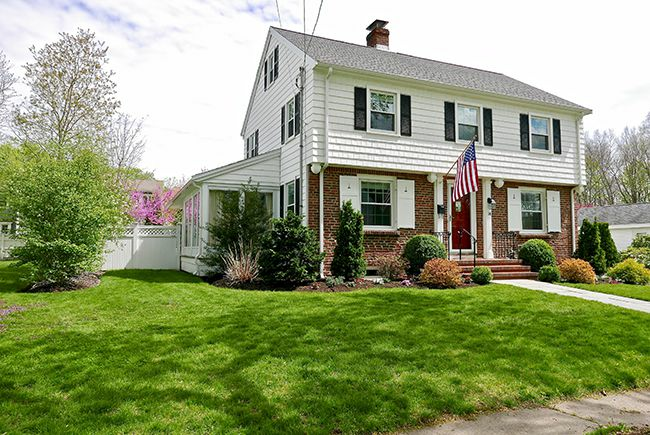 This exquisitely renovated and rejuvenated classic Garrison Colonial is located on a quiet dead end street, yet near highways, downtown and seaside amenities. All systems, floor plan, kitchen and baths updated and Master Suite and kitchen addition completed in 2013. First floor was re-designed for entertaining with high-end kitchen cabinetry, large granite island, top of the line appliances and French doors opening to large three- seasons, wrap-around room with mahogany floors. Living room is cozy with fireplace, built-in bookcase and window seat. Formal dining room has built-in china cabinet and opens to kitchen, half bath and mudroom. Glistening hardwood floors are throughout. Three seasons room looks onto professionally landscaped yard and patio. Second floor features four bedrooms and two, newer full baths, sensibly designed and beautifully finished. Master suite with cathedral ceiling and large custom closet, en-suite master tile bath with large shower with body sprays, two sinks and laundry near by. Dual unit central heat and air conditioning, in wall and ceiling audio and visual systems, wall mounted TVs ; full basement and walk-up attic; newer roof, siding and detached garage complete the picture. Come home to a residence where every detail was addressed with careful thought and quality workmanship!